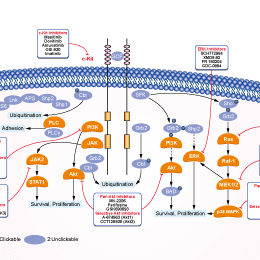 Effects of treatment for 48h with a vehicle or the indicated doses of MP-470 in parental or ER1 and ER2 cell lines in the absence and presence of erlotinib on the indicated biomarkers. Data represent 3 independent experiments. Nat Genet 2012 44(8), 852-60. Amuvatinib (MP-470) purchased from Selleck. Inactivation of AXL by MP470 reverses epithelial to mesenchymal transition. Immunoblot analyses of lysates from TGFβ/TNFα- treated MCF10A cells treated with varying amounts of MP470 for 72 hours. Oncogene 2014 33(10), 1316-24. Amuvatinib (MP-470) purchased from Selleck. Amuvatinib (3 umol/l, 72 h) leads to decreased pAXL, pAKT, and pERK expression by western blot. Melanoma Res 2014 24(5), 448-53. Amuvatinib (MP-470) purchased from Selleck. For MTT assays, cells (2,000 ~ 5,000 cells/well) were subcultured into 96-well plates according to their growth properties. Cell proliferation was assayed at 72 hr after treatment of MP-470 by adding 20 μl of 5 mg/ml 3-(4,5-Dimethylthiazol-2-yl)-2,5-diphenyltetrazolium bromide (MTT) solution per 100 μl of growth medium. After incubating for 3-4 h at 37°C, the media were removed and 150 µl/well of MTT solvent (either absolute DMSO or isopropanol containing 4 mM HCl and 0.1% Nonidet-40) was added to dissolve the formazan. Dr. Yong-Weon Yi from Georgetown University Medical Center. Amuvatinib (MP-470) purchased from Selleck. For the testing of inhibitory activity against c-Kit and PDGFRα, enzymes are incubated with varying concentrations of MP-470 and radiolabeled γ-32P-ATP. After 30 min, the reaction mixtures are electrophoresed on an acrylamide gel and autophosphorylation, quantitated by the amount of radioactivity incorporated into the enzyme, is assayed. Method: Cells are plated at a density of 2 × 103 to 1 × 104 cells per well in 100 μL medium on day 0 in 96-well Falcon microtitier plates. On day 1, ten μL of serial dilutions of MP-470 are added to the plates in quadruplicates. After incubation for 4 days, the cells are fixed with 10% Trichloroacetic acid solution. Subsequently, they are labeled with 0.04% Sulforhodamine B (SRB) in 1% acetic acid. After multiple washes to remove the excess dye, 100 μL of 50 mM Tris solution is added to each well in order to dissolve the dye. The absorbance of each well is read on a plate reader at 570 nm. Date are expressed as the percentage of survival of control calculated from the absorbance corrected for background absorbance. The surviving percent of cells is determined by dividing the mean absorbance values of the monoclonal antibody by mean absorbance values of the control and multiplying by 100. Formulation: Dissolved in corn oil for p.o. ; Dissolved in TV-10 (60% propylene glycol, 30% PEG300, 10% water, and 150 mg/mL 2-hydroxypropyl-β-cyclodextrin) or TV-10 (5% ethanol, 40% glycerol, 55% water, and 300 mg/mL cyclodextrin) for i.p. Bearss DJ, et al. US Patent, US/2008/0226747. Hurley LH, et al. World Patent, WO/2005/037825. Mahadevan D, et al. Oncogene, 2007, 26(27), 3909-3919. Qi W, et al. BMC Cancer, 2009, 9, 142. Welsh JW, et al. Radiat Oncol, 2009, 4, 69. Zhao H, et al. Radiother Oncol, 2011, 101(1), 59-65. Axitinib : c-Kit, IC50=1.7 nM. 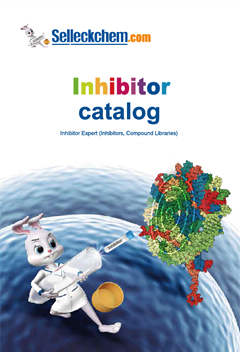 Tyrphostin AG 1296 : An inhibitor of PDGFR with IC50 of 0.3-0.5 μM, inhibiting FGFR and c-Kit with IC50 of 12.3 μM and 1.8 μM in Swiss 3T3 cells.